Event Lanyards Overnight, Fast & Cheap. Pushed for time? Running on a budget? Don't worry about it! We have unprinted lanyards in stock and available for same day dispatch to your door the next day! Have them delivered to your business or your event location, we are super flexible and will work with you to ensure your delegates or attendees don't go unidentified. With 12 colours in stock and 6 in stock ID holder sizes we won't be beaten on our range of overnight lanyards. Put us to the test now. Identification of participants attending events is always important, meaning organisers must determine the best ways to keep track of participants. The use of lanyards is a proven strategy for tracking and identifying those attending a wide variety of events. Since every event's needs may differ, lanyards are customisable, ensuring they are the best colours, sizes, and styles to meet a specific event's unique requirements. There are several factors to consider when looking for Overnight Lanyards. While not every event requires IDs, others do to ensure participants are in the correct venues and participating in the appropriate activities. Even when IDs are not required to attend events or specific sessions within the event, lanyards offer a way for participants to quickly get to know each other. With Lanyards Overnight easily available, there is never a need to proceed without knowing a participant's name or affiliation. Not every event needs strong, durable lanyards. If the lanyards are unlikely to be reused often, event planners can order economy stock lanyards that will look good while staying within a budget. 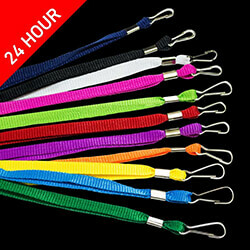 Even the economy lanyards are available in numerous colours with different clip options. Next Day Lanyards ensure you'll have them for an event even when time is short. While Unprinted Lanyards can be obtained in virtually any colour you need, we can also provide custom solutions when company or organisation logos and printing are required. Of course, the lanyards can also be upgraded to include coloured fittings or upgraded clips. Need ID holders or badge reels? We've got them ready to ship at all times. If you need dog clips, crocodile clips, or plastic crocodile clips, they are available at no extra cost. Of course, premium lanyards are built to last. Made of quality materials, they will stand up to more abuse than most people will ever dream of. Businesses, schools, and government offices routinely use lanyards to track employees or others using the property. Student IDs, for example, allow school administrators to monitor activities and quickly identify students. Lanyards can be adapted to hold access cards typically employed by security-conscious organisations, providing users with an easy way to carry their IDs throughout the workday. With today's emphasis on electronic locks to control movement within a building, lanyards make it possible for employees and visitors to have their access keys available. While we offer Fast Lanyards, Dynamic Gift takes pride in meeting all our clients' lanyard needs. We can easily print your company or organisation logo on customised lanyards. Our team of design experts can provide a virtual sample, allowing you to visualise the end product before we produce the lanyards. If your needs include additional promotional products, let our experts know what you need. We always guarantee to get you the materials you need quickly and, at the same time, deliver the quality you demand. Contact our team to get your order started.